I have been super busy lately preparing for the new school year in my music room! 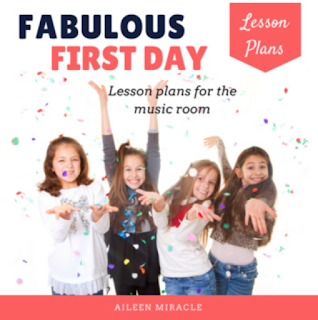 Since Back-to-School has been on everyone's mind lately, I am teaming up with a group of great music bloggers for a Back-to-School Music Blog Hop! 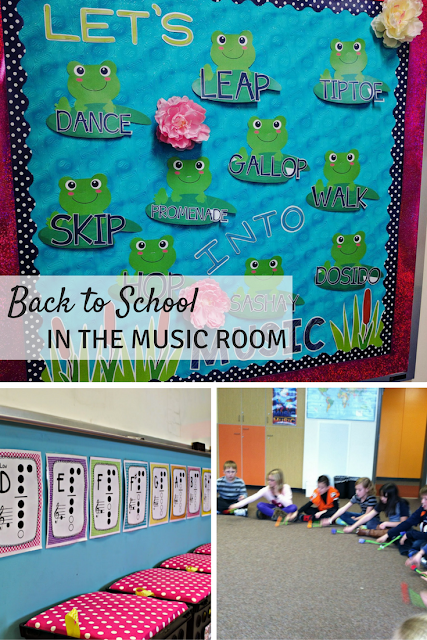 The blog hop includes six blog posts about Back-to-School in the music room, from lessons, to organization, to games, and more! To continue on the blog hop, keep clicking the picture at the end of each post to hop to the next blog! #1: Play some name games! Whether you've been teaching at the same school for ten years, or are at a brand new school with hundreds of new faces, it's super helpful to play name games, to get to know their names, and for them to get to know each other's names! Students put the beat on their laps as they say it, then each child says their name, and we all echo. (So we say the chant, a kid says his/her name, we echo, we say the chant again, etc.) I love this name game because it's great for steady beat and it's a GREAT way to get their names in my head! 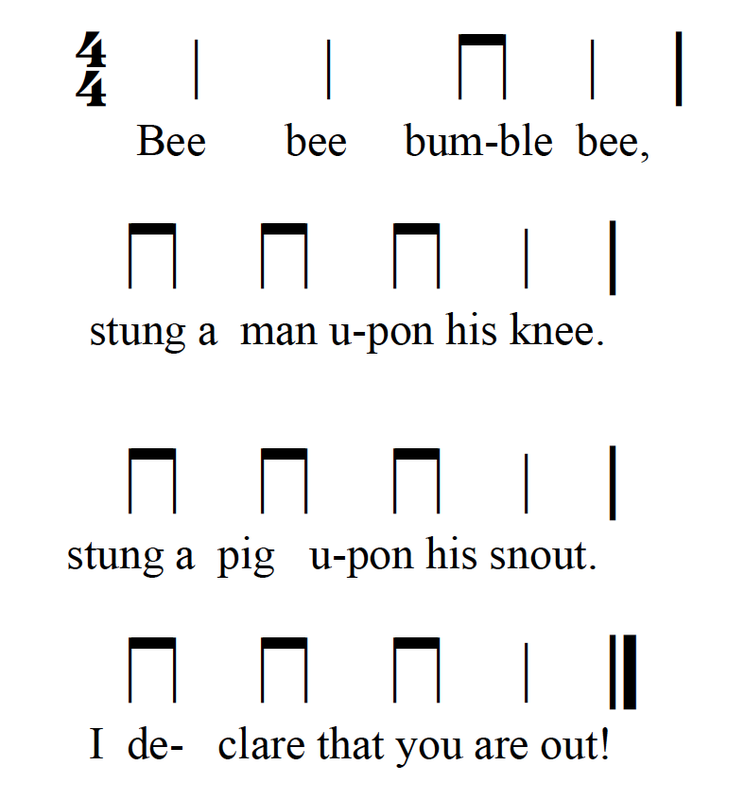 I also have had them clap their names, which is a great way to prepare/ practice rhythm! Any student who wants to says, "My name is ________," (everyone says, "yeah"), "I like ________," ("yeah"), "And I'll keep liking it," ("yeah"), "For the rest of my life," ("For the rest of your life!") I love that I can learn more about each student as we play, like that Abigail likes gymnastics, Corvin likes cookie dough, and Evan likes music! Another great set for discussing rules is Linda McPherson's Back-To-School set. 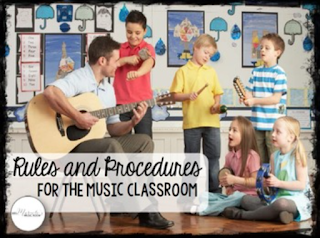 Once I play a name game with students and go over rules and procedures, I make sure to make music! 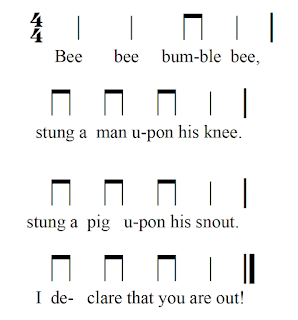 With my first and second graders, I played "Bee Bee," which for first grade was a great way to practice beat, and for second grade, was a great way to practice ta and ti-ti! To play the game, the teacher holds a bee puppet, and students stand in a circle with one fist out. As the chant is spoken, the teacher touches students’ fists to the beat. After the word “out,” the teacher buzzes 4 students; those students are out and sit down. Repeat until only one child is left; that child is the winner. After we play a game, it's easy to pull out concepts to review. 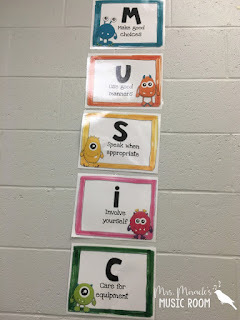 As I said with "Bee Bee," we reviewed ta and ti-ti with first grade. I like to start with the first concepts I taught the previous year in the first lesson of the year (in this case, ta and ti-ti and sol-mi), and then in the second lesson, begin reviewing the later concepts (rest and la.) 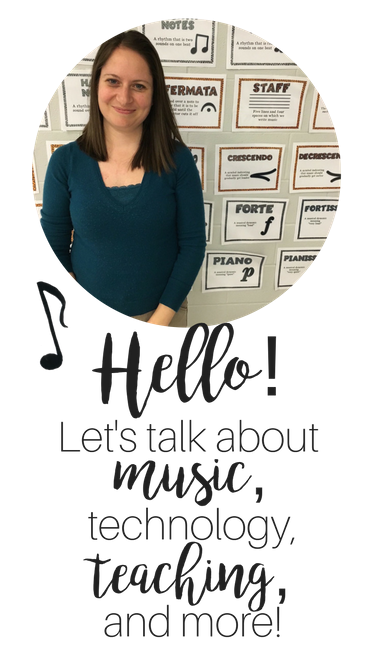 I make sure to start with pretty easy activities, like having students switch between the beat and rhythm, or having students read the rhythm of the song. This way, if they are a bit rusty because of summer break, they can still feel successful. 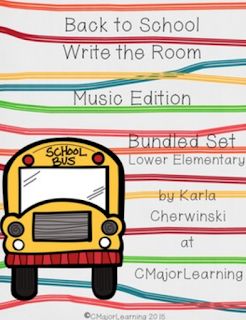 A great set for reviewing at the beginning of the year is C Major Learning's "Back to School Write the Room." With this set, students have to find rhythm flashcards around the room (like a scavenger hunt) and then write down the patterns they find on their worksheets. 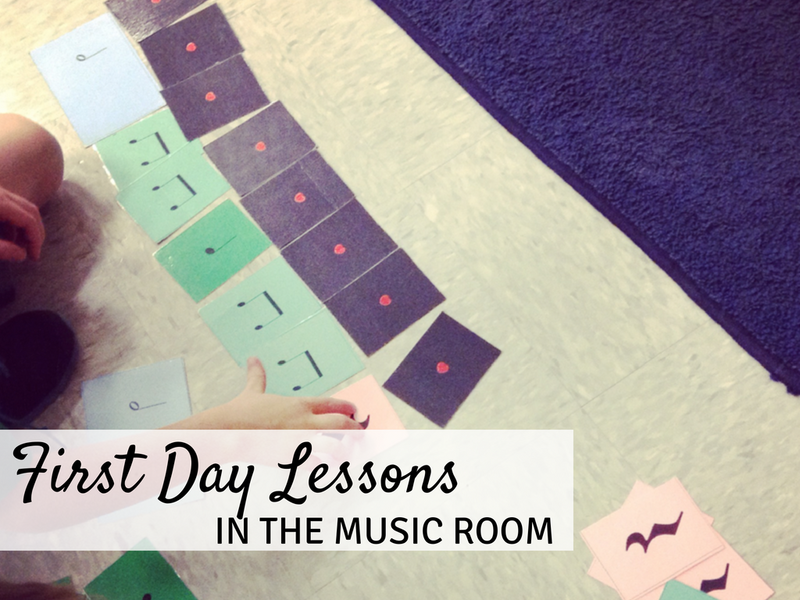 The kids have SO much fun, and it's such a great way to review rhythm writing at the start of the year! As I build relationships with students, I want to make sure to take time to just listen them talk about their lives. Yes, I only see them once every five days for fifty minutes, but I still think that it's important to set aside five or ten minutes to hear them talk about their summer. This year, I had them raise their hand and tell me a bit about their summer, if they wanted to. I had fun listening to them talk about their vacations, and also got to hear from students who are new to my school! I also have my third, fourth, and fifth graders play "Icebreaker Bingo," which is a game I created to have students get to know each other, and for me to get to know them as well! They circulate and ask each other questions, such as "Do you play soccer?" or "Do you want to be in choir this year?" and the first few who get a bingo (five down, five across, or five diagonal), get a prize from me (one of our good behavior certificates.) My icebreaker bingo sheets can be found in this set, which also includes first day lessons for K-5! I hope this post was helpful as you prepare for the new school year! 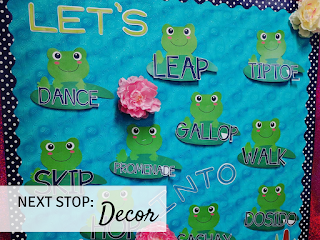 To read great tips about classroom decor in the music room, click the picture below to hop on over to Lindsay Jervis' blog. 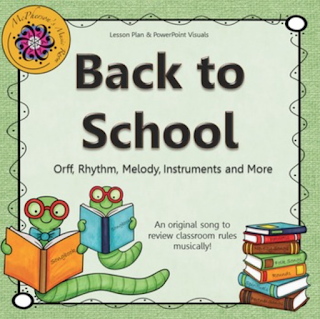 Make sure to keep on hopping to the next blog post, to read all six posts about Back-to-School in the music room! 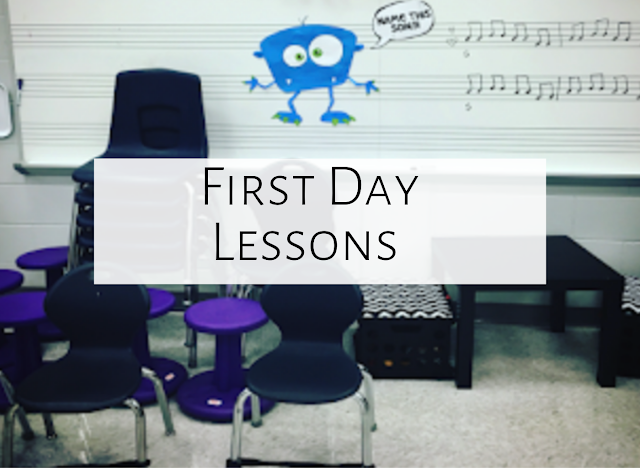 Feel free to comment below with your tips for first day music lessons. Thanks for reading, and have a great start to your year! Great post! Thanks for sharing your back to school ideas! Love the name games! Such a great post, Aileen!!! I totally forgot about Rickety Rackety!! and I LOVE Jump in Jump out!! !